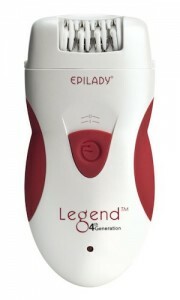 Epilady, as the name suggests, are a company which specializes in the making of Epilators. Whereas other manufacturers such as Braun have a wide range of electrical products, these are more niche, so do their products live up to expectation? We’ve reviewed a few of the Epilady range here on the site and have generally been impressed, today we’re taking a look at the EP-810-33A Legend 4 to see what it has to offer. This product seems to be a popular choice for people who are looking for smooth and silky skin. Though it can be used on legs, arms, underarms, face and bikini line, reviews suggest that naturally, the amount of pain while epilating increases in sensitive areas. But the good news is that loads of people have mentioned that this is one of the least painful Epilators out there! A real bonus. The main things to remember are to hold it at the correct angle (failure to do so can make it hurt) and to try and use it after a shower. Using a numbing cream or utilizing some of the other techniques we have mentioned here on the site can also help you out a lot. One thing that struck us about the EP-810-33A Legend 4 is the fact that it is really quiet in comparison to a lot of the other models, and is designed to be so, this is something Epilady have added to some of their models and is helpful if you’re looking to use it subtly or without irritating others! The reviews of this product on Amazon are really positive, and it is one of the top selling models out there, if we take a look at the price point, this is somewhere in the middle for a product of its type, and with loads of features such as dual speed and the fact that it is better for those of us who struggle with pain. Happy consumers shared that this product is great for removing hair long term, using it over time will reduce your need as hair begins to grow sparsely. So if you want to stop shaving like some satisfied users of this product than this is your epilating solution. This might well be the Epilator for you. It’s affordable, made by a company with a really great reputation, and we’ve found it to be both versatile and effective. Comes with our top recommendation. An epilator can be a girls best friend! It is an alternative to shaving which lasts longer, and isn’t as expensive (or painful) as waxing. It has become one of the most popular ways to groom your unwanted bodily hair. So, this makes choosing the right model to invest in an important decision. While there are many epilators available in the market products made by Epilady, the first producer of spring type Epilators, caught our attention. Although there are some products which are designed for hair removal in specific areas, there are some, such as the EP-810-44 that are designed to epilate everything, facial hair, arms, legs etc. If you are interested in the review of a tried and tested model that is both high quality and versatile enough to aid all areas of your body, then you are at the right place. With 40 tweezers the epilator creates 31000 tweezes per minute when placed at full speed, making it fast and efficient. This product seems to be a popular choice for people who are looking for smooth and silky skin with a product that works really well. Though the epilator can be used on legs, arms, underarms, face and bikini line, reviews suggest that the epilator is a little large to provide required precision for grooming upper lips and eyebrows. However, it works well for other parts of your body and as stated by tons of pleased users. If you can stand a little pain then you can definitely bid adieu to shaving. Reviews also suggest that this is among the more affordable multipurpose model of its kind available in the market. Also it is important to note that like other reviews suggest that the pain should not discourage you from epilating, as the pain will subside as you get used to the process. So if you are using this epilator cold turkey it will hurt but if you are used to epilating that this epilator is not bad at all. Don’t forget our guide to making Epilating hurt less. Our consensus, as well as that of most reviews you will find online, is that for an affordable Epilator, this does the business. If you’re looking for a cheaper model which is versatile enough to use on multiple areas of your body, then this is the one we would recommend. It isn’t the all singing, all dancing top of the range model, but it is good enough for most of us, and even though it is corded, unless you’re in need of a travel model then that shouldn’t provide too much restriction. Are you tired of those annoying hairs on your face? Do you want to get rid of your facial hair easily even without going to a salon or spa? Remove your unwanted eyebrow hair permanently or get rid of the peach fuzz? 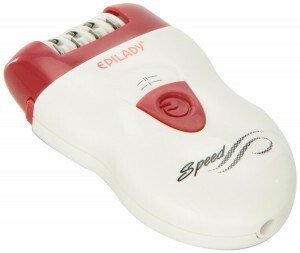 You can absolutely do it yourself anytime and anywhere just by using Epilady Esthetic –Delicate Facial Epilator. It uses a latest technology in effectively removing facial hair almost instantly and effortlessly without a complicated and painful process such as waxing, plucking, and many more. Specially made to remove facial hair – This facial epilator uses a state of the art technology to remove facial hair efficiently and ensure that the roots are included to prevent it from growing back quickly. It is absolutely much better compared to shaving and definitely faster than manual plucking. It is smaller than most epilators which makes it great for use in smaller areas, just like your face. Gentle on skin – It is 100% gentle on skin yet tough in removing facial hair. It does not leave chicken skin or any sign of hair removal, your skin would surely stay smooth as it is but without those little hair. Portable – Epilady Esthetic – Delicate Facial Epilator weighs only 0.3 ounces, which made it super lightweight. Product dimensions is 1 x 1 x 6”, which made it very portable so you can definitely bring it anywhere you go and remove those facial hair whenever you need to. It also comes with a carrying case to make it more convenient to carry, just put it in your bag and you are definitely good to go. Easy to wash – The kit comes with cleaning brush so you can easily wash it before and after you use it. It is certainly hygienic, which is highly essential in taking good care of your facial skin. This feature is perfect to prevent any skin irritations or allergy that might damage your skin. User friendly – This amazing product is so easy to use and it also comes with a complete manual that absolutely answers all of your concerns with regard to operating it. It is definitely easy and convenient to use. Battery operated – Two double A batteries are required to fully operate this product, you can also use a rechargeable battery to save more money. You do not need to carry a charger because as long as you have batteries, then you can enjoy its awesome features. Those are the wonderful features of Epilady Esthetic – Delicate Facial Epilator. It is absolutely convenient to use. You do not need to undergo expensive treatments all the time that requires so much time because you can get rid of your facial hair easily at the convenience of your own house. It ensures to remove facial hair from the roots so it would not grow back easily. It deals delicately with your skin that you might not even need a gel or Vaseline. It effectively removes your facial hair to achieve a smoother skin for a very reasonable price. You do not need to tolerate those tiny facial hairs because with this product in your bathroom, there is always a seamless way of removing it.